Hello and Welcome back! Some good history to see and read! The site has been used for religious buildings since at least the 4th century, when an oratory stood on the site. A cathedral was built in the 9th century, but was badly damaged by Norman invasions and was replaced in the 10th century, from about 940, when bishop Milo built a Romanesque cathedral. This building was the location of the Council of Troyes that opened on 13 January 1128/29, at which the Order of the Knights Templar was confirmed and its rule established. The Romanesque cathedral was destroyed by fire in 1188. 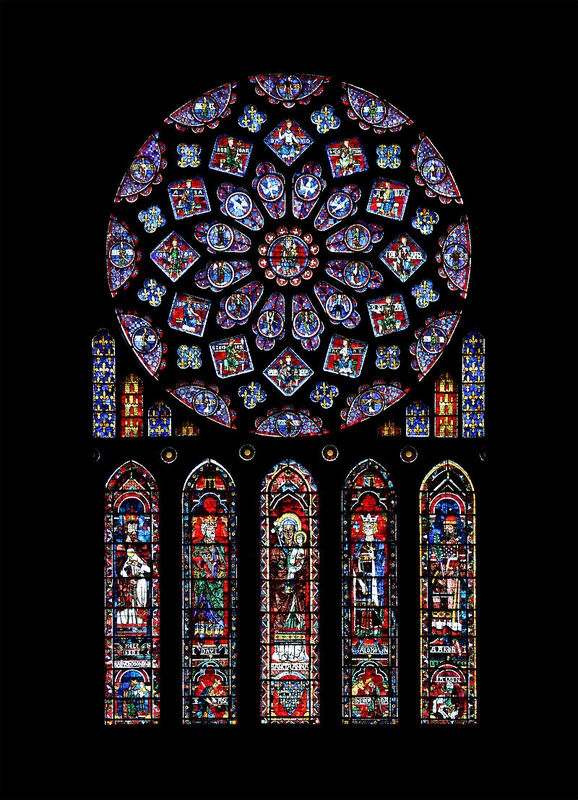 Construction of the present Gothic cathedral was ordered in about 1200 by bishop Garnier de Traînel and begun under bishop Hervé in 1208. Work continued until the 17th century. The cathedral only has one tower, St. Peter's; St. Paul's tower to the south was never built, and the building is thus still in fact unfinished. A steeple, with a height of 110 metres, once stood over the crossing: it was ruined by a tornado in 1365, and struck by lightning in 1700, after which it was not rebuilt. The cathedral structure has suffered other natural disasters: part of the choir was destroyed in a hurricane in 1228, and the roof was set afire by lightning in 1389. The earliest part is the 13th century choir. The elaborate façade dates from the beginning of the 16th century. The three main portals are the work of the architect Martin Chambiges. The cathedral escaped destruction during the French Revolution, but was de-Christianised and turned into a Temple of Abundance for several years. 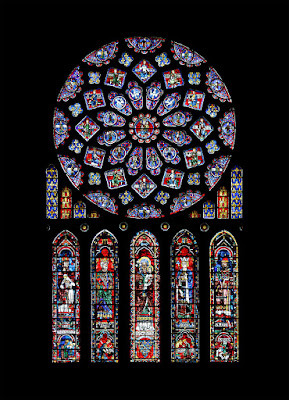 It is particularly noted for its exceptional stained-glass windows of dates from the 13th to the 19th century, with a surface area of 1,500 m, and for the magnificent treasure containing among many other important works the reliquary casket or shrine of Saint Bernard de Clairvaux and his closest friend Saint Malachy of Ireland. The cathedral, containing the nave, two principal aisles and two further subsidiary aisles, is 114 metres (379 feet 6 inches) long and 50 metres (162 feet 6 inches) wide (across the transepts), with a height from the top of the vault of 29.5 metres (96 feet); the height of the cupola and the tower is 62.34 metres (202 feet 7 inches). The Stained glass above shows much of the birth of Jesus. In May 1420, the Treaty of Troyes was signed in the cathedral between Henry V of England, his ally Philip of Burgundy and Queen Isabel, wife of the mad Charles VI of France whereby the throne of France would pass to Henry on the death of Charles rather than to Charles' son the Dauphin. Henry married Catherine of Valois, the French king's daughter, shortly afterwards in Troyes, either at the cathedral or the church of St Jean. In July 1429, Joan of Arc escorted the Dauphin to mass in the cathedral en route to proclaiming him Charles VII of France at Reims cathedral, in contravention of the recently signed Treaty of Troyes. That's all for now! May sunshine fill your day!